In the midst of the majestic Adirondack Mountains, overlooking pristine Friends Lake, there stands a wondrous Guesthouse where luxurious lodgings, sumptuous beds, indulgent baths and unforgettable breakfasts join in an atmosphere of rustic elegance and lakeside living. 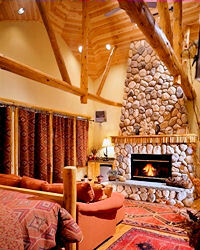 The Lodge's intimate guest rooms are uncommonly comfortable ~ both rustic and elegant, even magnificent. All guest rooms have king-size beds, large stone fireplaces and wonderful lake and/or mountain views, all have private luxury baths with deep-soaking Jacuzzi tubs, all rooms have a small wet-bar and refrigerator and television. The nightly rate includes an unforgettable breakfast, nightly turndown service, Wi-Fi and a variety of on-site activities. Within the lodge, enjoy the many public areas; in the evenings guests gather round the out door fireplace on the screened in porch. The ground floor that walks out to the lake features many relaxing sitting areas, a pool table, the wine cellar, a game table, a nine-person theatre, a sauna and exercise equipment. Our 70- acre wooded property borders on pristine Friends Lake. Use our Kayaks or lounge in the sun before a dip in the lake. The lake is well-known for small mouth bass fishing. There is very nice hiking, cross-country skiing and snowshoeing right here on the property. This and other NY Bed and Breakfast Inns can be found here online in The Register.